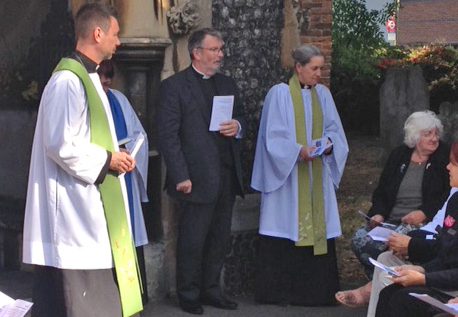 The iconic spire of St Mary’s Church St Mary Cray was rededicated on Saturday afternoon (8 October) in the presence of the Archdeacon of Bromley. Members of the local community joined with the congregation of St Mary’s and St Andrew’s churches (Cray Valley Benefice) to celebrate. The bells rang, the sun shone, praise and worship were offered and bubbly refreshments added to the festivities. ‘Our church is the root of the community’ said a local resident. Rev jane Winter said: ‘it has stood as a place of stability and sanctuary for over 700 years’. Archdeacon Paul reminded everyone: ‘it points the way to God and is a vital part of community life’.